Tremolo stopper on a Floyd Rose-equipped 6-string for low tunings? Discussion in 'Beginners/FAQ' started by The Silent Man, May 9, 2018. First of all, I apologize for the length and details of this post. I wish to thank each of you for taking a couple minutes in understanding my actual doubt. I tried to point out my needs clearly; please forgive any lack - english is not my native language. I want to buy a "standard" 6-string Jackson (Pro) Soloist, with neck-through construction and Seymour Duncan pick-ups, that I plan to use for low/drop tunings: D, drop C, C and B.
I want to be able to shift tunings quickly between D and B - just like I currently do on my Ibanez RGD321 with extra long scale (26.5") and fixed bridge. Yes, that's an interval of 3 half steps, so minor string flattering in B would be acceptable. I would keep the string gauge as thin as possible. knowing what a pain in the backside is a Floyd Rose, this time I was exceptionally looking for a hardtail bridge - just because it would make it possible to change tunings within minutes (I know it from my Ibanez RGD321). However on this side of the planet, there is basically no difference in price between the Soloist with Floyd Rose bridge and the same Soloist with hardtail bridge! For the same amount, I'd love to get a Floyd Rose - even if I have no (initial) plan of using it. It would be a plus to still have it, meaning that (with a proper setup and string change) the guitar could be brought back to a standard E tuning axe at any time and for any reason - something I would not do with a hardtail bridge model. I know how a Floyd Rose works and I totally understand the easy way for my needs would be to go for a hardtail bridge - no doubt about it. But I recently found out that there are some devices, called Tremol-No, whose purpose is to mechanically block the floating bridge - in a reversible way. Is this a possible solution to get the best of both worlds? Since I am not going to buy a baritone guitar but rather a standard guitar with 25.5" scale, I like the idea of getting a regular, versatile axe equipped with Floyd Rose that I can potentially (re)use for anything, later. 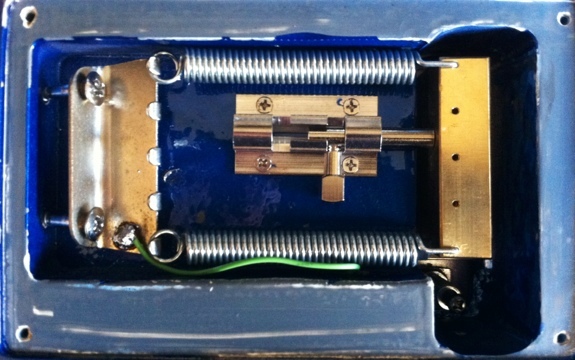 Would a tremolo stopper on a standard guitar make it possible to have a "reversibly fixed" bridge that works fine with low tunings, allowing me to shift between them like I would on an actual hardtail bridge (while keeping a potentially "reversible", versatile guitar with Floyd Rose)? Has anyone here tried a tremolo stopper with low tunings? EDIT: I think I misread your post. There's no way in hell you will want to try doing two tunings at the same time on a guitar with a floating bridge, regardless of whatever gadget you add to it. You plan on using the same string gauge for all of those tunings? Not sure how much you'll like the change in string tension. The Tremol-No on the other hand probably won't work that well with that much of a swing. It uses a couple thumb screws as the mechanical/friction lock to keep the trem from moving, those can only handle so much change in string tension before they start to slip. If you were changing by only a 1/2 step or dropping, then it's probably going to work OK.
And this isn't even considering intonation & neck relief. I've used tremolo stoppers and Tremol-No units in several guitars, but mostly because I barely use floating bridges honestly using the same string gauges for two tunings so far apart will be far from ideal IMO. The Tremol-No is a great unit, but you could only be full-floating in your higher tuning; the B tuning could only used in dive-only or fully blocked modes. Best solution would be to have two separate guitars to have one in each tuning, but that's expensive. Next best option would be to get the Floyd version of the Jackson, set it up in D, then use a Digitech Drop pedal to shift it down to B when you need it. That way you can have a fully floating bridge all the time, but still get to play in both tunings. The Silent Man and NateFalcon like this. I've used the Tremol-No before, and from my experience the locking mechanism doesn't hold well for that much change in tension. Like already said, it will slip if you go more than drop tuning a single string really. The Silent Man likes this. Why are you talking yourself out of the need to buy two guitars?! Most of us are trying to justify buying more! Agree with the others. Digitech drop pedal if you're playing live and can't hear your instrument acoustically. (For recording though, the clashing sound of your unplugged sound is REALLY distracting). Tremol-no gadget isn't really that capable for what you want - plus all the other problems of string gauges, tension, neck relief, intonation, string action etc. Just get two guitars. No idea what your budget is, but 25.5 scale guitars with fixed bridges are probably the most common category ever. Personally, I'd pick up two ESP LTD models and set them up for different tunings - one for D and one for B. Then you could tune the D guitar down to drop C, and tune the B guitar up to C with almost no issues. The Silent Man, Mathemagician and bostjan like this. I am hesitating because I'm afraid a tremolo bridge + tremolo stopper would not cover my 3 half-steps interval like my fixed bridge Ibanez does. Since getting 2 guitars for down-tuning is not an option for now, I want to understand how far can the tremolo stopper be pushed. 2. Quite frankly, you should not be using the same strings to tune 3 half steps, so, the entire approach is flawed right from the start. 3. The trem stoppers out there are designed to stop up trems. They are not designed for what you want to do with them. I mean, I could use the hope diamond to cut open envelopes, but that's not what it's supposed to do. 4. So you have a fixed bridge guitar that suits your #1 need. You want to buy another guitar that does not suit your need. I see a huge problem here in your problem solving approach. You are creating a problem rather than solving one. Why are you doing this in this way?! Quite frankly, you should not be using the same strings to tune 3 half steps, so, the entire approach is flawed right from the start. I am conscious that the 3 half steps inverval approach is flawed, but I currently cannot dedicate more than 1 guitar to down-tuning and 1 guitar to 7 strings. Of course I don't play live with the baritone, it's mainly for songwriting, tuning experiments and occasional rehearsals. So you have a fixed bridge guitar that suits your #1 need. You want to buy another guitar that does not suit your need. I see a huge problem here in your problem solving approach. You are creating a problem rather than solving one. Why are you doing this in this way?! I mostly play regular 6 strings and I have very, very, very limited space (and some other guitars I can't part ways with). The missing piece is that I am selling that Ibanez RGD (and also an Ibanez K7), I can't keep all those I'd like. The Tremol-No on the other hand probably won't work that well with that much of a swing. It uses a couple thumb screws as the mechanical/friction lock to keep the trem from moving, those can only handle so much change in string tension before they start to slip. If you were changing by only a 1/2 step or dropping, then it's probably going to work OK. So even if I get a good tremolo stopper I won't be able to shift quickly between those tunings. I currently use one string gauge for the 3 half-steps interval. Of course the result is not great when it's tuned in B (the lowest tuning I use) but I currently have no space for more guitars, so it's a necessity rather than a choice. We love to be proven wrong. If you are willing to give it a go, then see how it works. Why do you need so many tunings, anyway? Usually people who use a lot of tunings are the types who have a lot of guitars. If you are just using the drop tuned guitars for your own recording projects, then why bother with so many tunings? Would it be possible for you to use your seven string instead of the B-tuned six string? If not, why? I'm curious because it seems like you have already thought of all of the simple solutions and rejected them. The Tremol No wasn't made thinking in changing tunnings. It was made as a away to quickly Block all together or make it a Dive only Trem. When you change tunnings the tension on the strings change completely, so if if you lower you tunning the strings will pull the Trem and the force is too much for the Tremol No to take it. You can use it to drop the Lower E, make it a Drop D or something, but more than that and it goes away of its design philosophy. Unfortunately it's not just the money, but the lack of space - forcing me to concentrate on very few guitars. I need a versatile instrument to cover as many needs as possible. Fixed bridge seems to be the choice in this case. I know the string gauge can't be perfect for all the tunings, but do you really think it would be physically possible to still use the Tremol-No unit with all those tunings? Several players here seem to think otherwise. The Digitech drop pedals are nice, but I'd rather stick to the "mechanical" tunings instead of digital signal processing - for several reasons. I may be off base here because I've never used the Tremel-No before, but I think you can. I'm not sure of how much time it would save you, though. While the device is installed, the bridge won't move, making it essentially a fixed bridge guitar- which is great if you just love the bridge design of your trem unit. If you want to change tuning though, the amount of force exerted on the Tremel-No will likely cause it to buckle; meaning if you wanted to change your tuning, you'd probably have to adjust the Tremel-No first. I'm sure it could work for any tuning you want, you'd just have to tweak it in between. It won't be as simple as turn peg -> new tuning. So I'm not really sure if that'd be worth it to you, then; since without the unit, you'd still have to set up the trem when you changed tuning anyway. Yeah. I'm a total noob with Floyd's but I have some kind of feeling that you're going to probably need to constantly adjust the locks and screws back and forth between the two tunings. Thanks for your input. I am looking for some feedback from actual Tremol-No users like you. I think mine would be a battle against Physics in the already unstable world of electric guitars.